Oil on canvas, 107 x 137 cm. Together with Jan Both, Nicolaes Berchem was one of the leading exponents of the Italian-inspired landscape painting in the 17th century. Berchem dedicated his efforts to capturing the beauty of the South European landscapes with their golden light, majestic nature and peaceful pastoral life. This mountain landscape may very well have been borne out of an impression of a journey the artist is thought to have made to Italy in the 1640s. In addition to reproducing the warm, bright glow of the dawn, Berchem was also interested in depicting rural life among the people who lived close to nature. 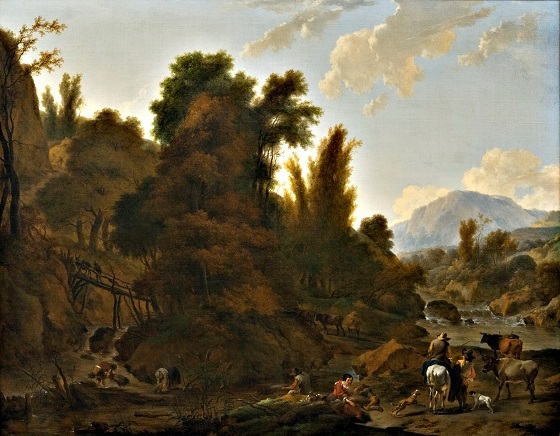 His idealised rural scenery became a source of great inspiration to later generations of artists, both domestically and abroad, including the Dutch landscape painter Barend Cornelis Koekkoek and the French Rococo painter Jean-Baptiste Pilement.